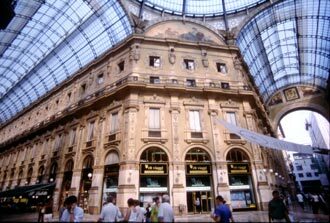 Italy's leading industrial region, as well as its most populous, Lombardy is home to three distinct landscapes: fertile flatlands, verdant foothills, and snowy mountains. Rice and corn thrive in the northern climate, resulting in a rich repertoire of risottos and polentas. 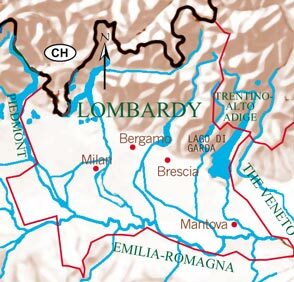 Veal, beef, butter, and cow's milk cheeses appear at nearly every meal, and sweetwater fish caught in Lombardy's many lakes (including Italy's largest, Lago di Garda, and its most opulent, Lago di Como) round out the diet. In the Valtellina area of Lombardy, there is a classic dish called pizzoccheri alla Valtellina. It's made with wide buckwheat pasta ribbons (the pizzoccheri) tossed with boiled potatoes and cabbage, melted butter flavored with sage leaves, and a local cheese called Casera or Scimud. This is my simplified take on this dish: I've embellished the sauce with caraway seeds; substituted sautéed cabbage for boiled; omitted the potatoes; and replaced the Casera or Scimud with the more easily obtainable Fontina, a nutty cow's milk cheese. 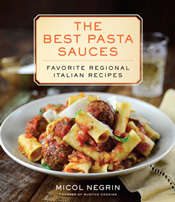 You'll find pizzoccheri and Fontina in Italian markets. Melt the butter in a 12-inch skillet over medium heat. Add the onion and cook until wilted, about 5 minutes. Stir in the caraway seeds and sage leaves, cook 1 more minute, and add the cabbage. 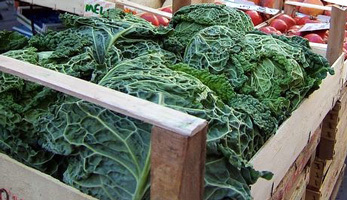 Season with 1/2 teaspoon of the salt and the pepper, and cook, stirring often, until the cabbage is limp and lightly browned in spots, about 10 minutes, adding a bit of water by the spoonful as needed to prevent the cabbage from burning or drying out. Meanwhile, bring 4 quarts of water to a boil. Add the pizzoccheri and the remaining 2 tablespoons of salt, and cook until al dente. Drain, reserving 1/2 cup of the cooking water. 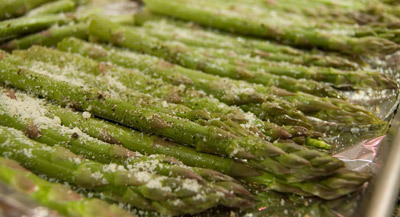 This is my favorite way to enjoy asparagus: adding a bit of water to the pan as the asparagus roast ensures that they cook up tender and sweet. In Lombardy, they often boil the asparagus before roasting, but the streamlined method below yields tastier and brighter asparagus. Preheat the oven to 375°F (preferably set on convection bake). Line an 11-inch x 17-inch baking sheet with aluminum foil and grease lightly with olive oil. Arrange the asparagus on the baking sheet in a single layer, with the tips facing in the same direction (this will make serving easier later). Pour the water into the baking sheet. 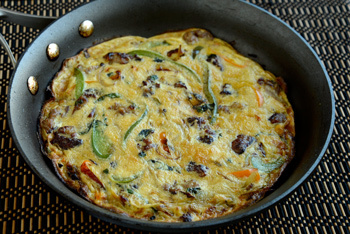 Substantial enough to serve as a one-dish meal on summer's hot nights, this hearty frittata is lovely at room temperature with a glass of Sauvignon Blanc. Taleggio is a nutty cow's milk cheese that has been produced in Lombardy since the Middle Ages; it has a subtle truffle aroma, especially close to its rind. If you can't find Taleggio, use any favorite melting cheese--even cubed Mozzarella will do in a pinch. Heat 1 teaspoon of the olive oil in a nonstick 12-inch skillet over a medium flame. Add the leeks, potato, onion, and string beans; season with 1/4 teaspoon of the salt and 1/8 teaspoon of the pepper. Cover with a tight-fitting lid and cook 15 minutes, stirring often. Lower the heat to medium-low and cook 10 more minutes, or until the potato is tender. Meanwhile, beat the eggs with the basil and the remaining 1/4 teaspoon of salt and 1/8 teaspoon of pepper in a large bowl. Fold the hot potato mixture into the eggs, beating constantly to avoid scrambling the eggs since the eggs are cold and the potato mixture is hot. When they are in season, add 8 trimmed baby artichokes along with the carrots and potatoes. Dredge the shanks in the flour, shaking off the excess. Heat the olive oil in a deep, heavy-bottomed 14-inch sauté pan over a medium-high flame. 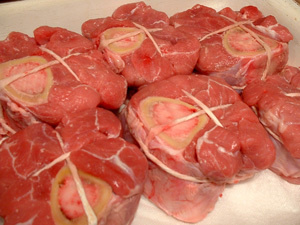 Add the veal shanks and cook until lightly browned on both sides, turning once, about 5 minutes per side. Add the Pancetta, onion, garlic, and celery, season with the salt and pepper, and cook until the vegetables soften and the Pancetta becomes golden, about 5 minutes. 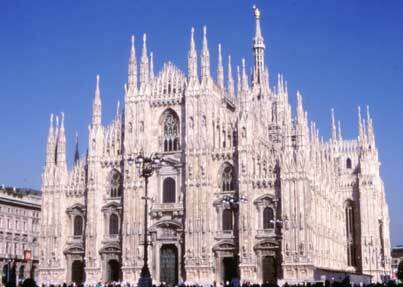 This stick-to-your-ribs main course is a specialty of Milan. If you can't find Pancetta, use bacon instead. Melt 1 tablespoon of the butter in a 12-inch sauté pan over medium heat. Add the Pancetta and cook until golden, about 5 minutes, stirring often; remove to a plate. Dredge the veal in flour, shake off the excess, and add it to the butter in the pan in a single layer. Cook the veal until golden-brown on both sides, about 5 minutes per side, turning once. Season on both sides with the salt and pepper. Add the sage, thyme, and rosemary; cook 1 more minute. Deglaze with the wine, cook until it evaporates, about 5 minutes, and then add the broth. Return the Pancetta to the pan. Cover the pan and cook the veal chops for about 20 minutes, turning them once in the cooking juices and adding broth if needed. Uncover the pan, remove the veal to a platter, and reduce the cooking juices until they form a rich, thick glaze over high heat, about 2 minutes. Panettone has become symbolic of Christmas all over the world. First made in Milan hundreds of years ago, this high, delicate, buttery bread is made with a natural yeast starter that keeps it moist and tender for months after it emerges from the oven. Legends concerning its origins abound. There are those who claim that a young baker named Toni added candied fruit to a simple bread dough to increase sales at the failing bakery where he worked. Others say that the young baker was enamored of the bakery owner's daughter, and won her heart by creating this spectacular bread. But no matter how panettone came to be, today Italians on every continent cannot imagine celebrating the holidays without a slice of this decadent sweet bread. When buying panettone, read the label carefully: butter, eggs, flour, and sugar should be the primary ingredients. Don't purchase panettone made with margarine--not only is it far less tasty than butter-based, it will leave a greasy feel on your palate, and you can be sure that it is far from artisanal. Panettone is made in Milan by a number of reputable large-scale bakeries; one of my favorites is Le Tre Marie, pictured below. 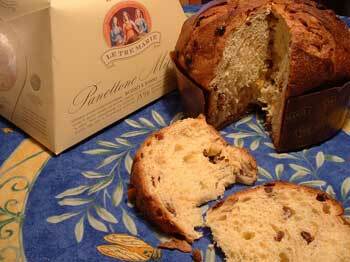 Some panettone is studded with raisins and candied fruit, in classic fashion; recent versions include hazelnuts, almonds, or chocolate. A good panettone will last you a few weeks after opening, as long as it is kept in its crisp plastic wrapping. Don't refrigerate it after opening, or it will dry out. If you have way too much panettone left over after the holidays pass, you can always use it to make French toast or bread pudding (check my cookbook, Rustico: Regional Italian Country Cooking for a delicious Marsala-laced panettone bread pudding). This holiday season, buy enough panettone for everyone on your holiday list. And when you savor your panettone, be sure to pour some Moscato d'Asti (a lovely sweet wine made from Moscato grapes) alongside for a truly Italian holiday experience. Click here for a chocolate tiramisu recipe featuring panettone.